This is a piece from a few weeks ago for Wired – a bit of an exclusive – and either read it here in full or follow this link. Even if the charismatic Professor Tara Shears laughs at the thought of there ever being enough antimatter in the world to make Star Trek’s warp drive a possibility, there is nevertheless something “boldly going” about her as she starts to explain to me the latest antimatter research results to be announced from Cern. The results come at the start of the “long shutdown” — two years during which the beam of the Large Hadron Collider is off, allowing it to have a £70m upgrade — and represent a success story for British science. Professor Shears is one of the leading British scientists at Cern and has recently broken new ground by becoming the first female professor of physics at the University of Liverpool. According to Shears, CP violations were observed experimentally in kaons (or K mesons) in 1964, even if they had not been predicted. Since then, CP violation has also been seen in another type of meson (B) and looked for in D mesons. Until recently it had not been observed in a fourth similar particle — the Bs meson — owing to the lack of a powerful enough accelerator to create the number of collisions necessary to see CP violations. The LHCb is one of four main experiments sited at the Large Hadron Collider. 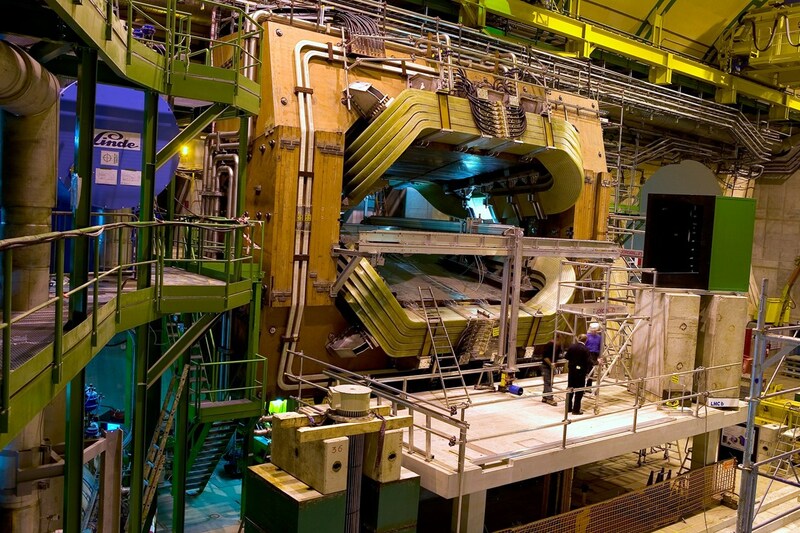 About 25 percent of the scientists working on the LHCb are from British universities. British universities also built major parts of the vital RICH and VELO particle detectors that make these measurements possible. The Standard Model of physics is the kind of physics that we learned at school: how electromagnetic and subnuclear reactions influence the movement of subatomic particles. The “new physics” is what might explain the things the Standard Model cannot, such as the nature of dark matter and where all the antimatter went. After all, “the interesting thing” is that half the universe was made up of antimatter at the time of the Big Bang and that a very small difference in behaviours between means that “there was a tiny amount of matter left over to give us our universe”. For Professor Shears, who is rapidly becoming the go-to scientist to explain all things Cern it was this desire to find the answers to the big questions in physics that propelled her from the local comprehensive in rural Wiltshire to “the baptism of fire” of being the only girl in her A level physics class at the independent Dauntsey’s School, and from there to study physics at Imperial College London followed by a PhD in particle physics at Cambridge. She was drawn to particle physics in particular because “you can’t get anything more fundamental than that. If you are really trying to understand something the most natural approach is for me to unwrap it and look at its constituent parts. However, she says, “I learnt my craft at Cern back in the 1990s”, when she worked on the forerunner to the LHC, the LEP, a particle collider with much lower energy that looked at electrons. Then in 2000 she won a Royal Society University Research Fellowship and went to work at the Fermilab particle physics facility near Chicago, where she continued to explore her research on high energy particle physics. Four years later she was back at Cern, joining the LHCb experiment at the Large Hadron Collider particle accelerator, which was investigating differences between matter and antimatter, and testing the Standard Model of particle physics. Her own particular research focuses on exploring electroweak forces. This sense of collaboration extends to the 650 members of the LHCb experiment who have to approve research before it is published. “Now there is a higher percentage of women” but it is “still not enough”, she admits. For Professor Spears the application of this antimatter research is not about interstellar space travel. It is about saving lives. So while mixing matter and antimatter together may have been a very efficient power source for the Enterprise, in real life “there has to be a cheaper and quicker alternative for space travel”. For Professor Spears who will likely be appearing on a TV screen new you soon, the results announced today are only the start of the journey “that will see us trying to get more hints about what lies beyond the Standard Model”. “If that does sound very Star Trek it is because, she says, they share “the same very optimistic view of the future”. Previous The Diagnostic and Statistical Manual of Mental Disorders has been updated but should we beware this manual’s diagnosis?